This ain’t your mama’s saree. The sari is a fixture — a humble or extravagant six to nine yards of fabric, tied with mathematically precise pleats and in such a way to hide and expose simultaneously. It is draped on everyone from world leaders to laborers. The sari is a constant in South Asia. Printed on local paper and using the one color serigraph technique, “Unfolding the Saree” has the feel of a vintage, Indian pamphlet. When it’s unfolded, one side has the color-blocked look of a sari (complete with paluu) and the other explores the dichotomies of the outfit. 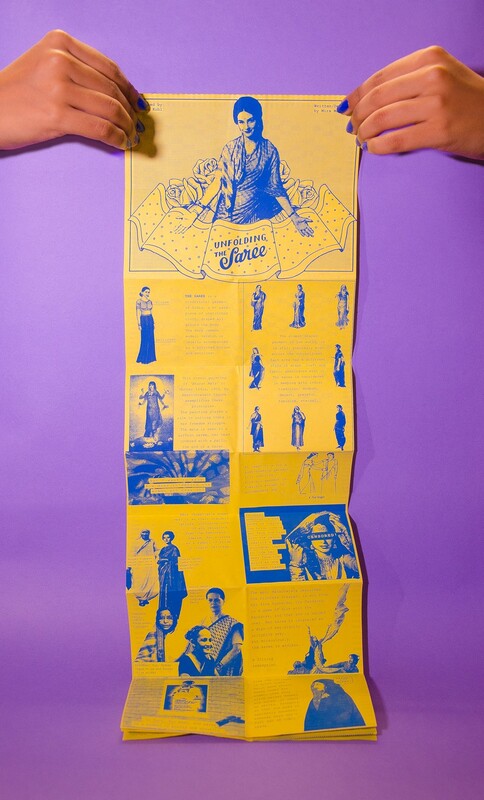 The sari, the zine explains, is simultaneously “the sexiest thing a woman can wear” and a symbol of power. It’s also an outfit that accommodates all body types and is worn by women of every age. It both exemplifies the culture of misogyny in South Asia as well as its thriving feminism. The sari is a garment of opposites, and “Unfolding the Saree” beautifully explores this. Reading the zine is a physical act that requires precise folding and a careful touch, which is at times an uncanny manifestation of its content. Find out more about the zine and Studio Kohl on their site and grab your copy of “Unfolding the Saree” here.